Now, we don’t claim to be BBQ experts at all, but we’ve got a favorite spice rub that has us making it by the mason jar so it’s ready to use at a moment’s notice. We love it on pork (especially ribs & shoulder), chicken, and sustainable salmon too! We like it so much that we decided to give it to our amazing dads to spice up their Father’s Day — it makes the perfect homemade gift that can be savored and enjoyed, whether they want to save it for themselves or make for a BBQ get-together. And, we added a simple nautical touch to the jar to give it those summer coastal vibes that none of us can seem to get enough of! 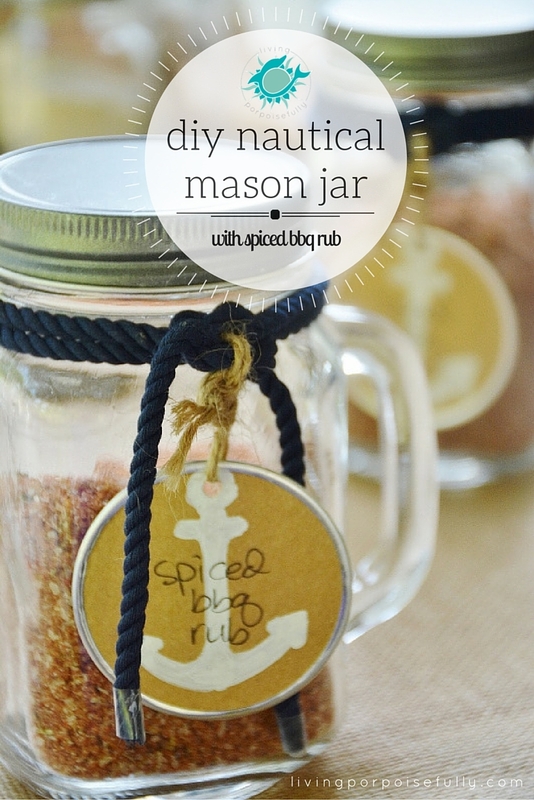 Just a DIY anchor gift tag and navy blue rope. So simple, and we’ll show you how. Once mixed, pour into 2 pint-sized mason jars. And it’s all set to go to give as a gift (or use for your own BBQ celebrations)! Don’t be shy with the seasoning now — you’ll want the meat completely covered with it before cooking. Mmmm we’re going to have to whip up another batch just for us now. Enjoy! A great father’s day idea and craft !! !